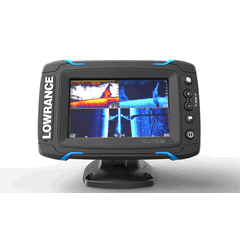 Lowrance is announcing a NEW family of fishfinders/chartplotters - The Elite-Ti series, featuring 7 and 5-inch touchscreen displays. The Elite-Ti series combines high-end features with powerful performance at an affordable price. The Elite-Ti series features 7 and 5-inch standalone displays that include a touchscreen, easy-to-use interface, CHIRP Sonar, StructureScan® HD SideScan and DownScan Imaging™, built-in GPS antenna and a wide range of high-definition mapping optio ns. Elite-Ti models support Low/Mid/High CHIRP and 50/83/200/455/800kHz frequencies. Integrated wireless connectivity allows boaters to download software updates and Insight Genesis custom maps directly to the unit. CHIRP Sonar, StructureScan© HD and DownScan ImagingÙ - CHIRP Sonar offers improved fish-target separation and screen clarity, while the StructureScan© HD sonar imaging system with exclusive Lowrance DownScan ImagingÙ delivers photo-like images of fish-holding structure on both sides and directly beneath your boat. StructureScan HD requires optional TotalScanÙ transducer. Optional chart upgrades - Global chart upgrade options include Navionics + and Jeppesen C-MAP MAX-N and MAX-N+.